Embargo until Tuesday, May 29th, 6:00a.m. The Taub Center’s “A Picture of the Nation 2018,” which presents updated data on Israel’s society and economy in its 70th year, was published today. The findings in the booklet, generously supported by the Koret Foundation, present a complex picture of Israeli society: the standard of living in Israel has increased, as have employment rates, and there is evidence of changes in the demographic composition of the population. At the same time, food and housing prices remain high, and disposable income poverty rates are still higher than in any other OECD country. An international comparison shows that Israelis are relatively healthy and have high life expectancy, but it seems that the health system is not prepared to cope with Israel’s aging population, along with all the costs that entails. There have been trends showing improvement in the education system, such as an increase in the share of students studying advanced mathematics (5-units) and a substantial improvement in the academic achievements of Arab Israelis, particularly among women. Arab Israeli women also participate in the labor force at a higher rate than in the past. The rate of employment for both men and women has risen among Haredim (ultra-Orthodox) as well, but there are gaps between the various Haredi streams. The booklet was edited by Prof. Avi Weiss, Director of the Taub Center and Professor of Economics at Bar Ilan University. Israel’s current population is comprised of approximately 74% Jews, 21% Arab Israelis (17.6% Muslims, 2.7% Bedouin, 1.9% Christians, 1.6% Druze), and 5% defined as “Other.” Haredim are estimated to be about 12% of the total population, and the share of secular and traditional Jews – about 56% (pages 14-15). The total fertility rate in Israel is high and stands at 3.11, almost double the rate in OECD countries. 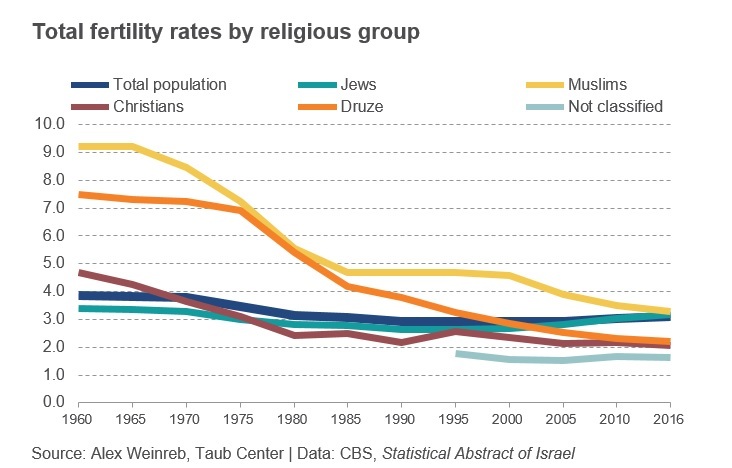 In recent decades, there have been significant changes in the fertility rates of all population groups, especially among Arab Israelis: since 1960, the fertility rate among Muslims has dropped by about 64%, and among Druze by 70%. On the other hand, among Jews there has been an increase in fertility since 1990 due to an increase in the share of Haredim and an increase in fertility rates among secular and traditional Jews (page 17). The number of children who began studying in first grade in the Arab education system has declined – a trend that is consistent with the decline in fertility rates for Arab Israeli women. Among Jews there is no such correlation: the number of first graders in the Haredi education system has increased significantly, but is lower than expected when taking into account fertility rates – and the greatest surprise is that the number of students in the State education system has increased at a higher rate than expected (page 18). An examination of student movement between religious education streams reveals that between first and eighth grades most of the student movement is in the direction from more to less religious streams (page 20). 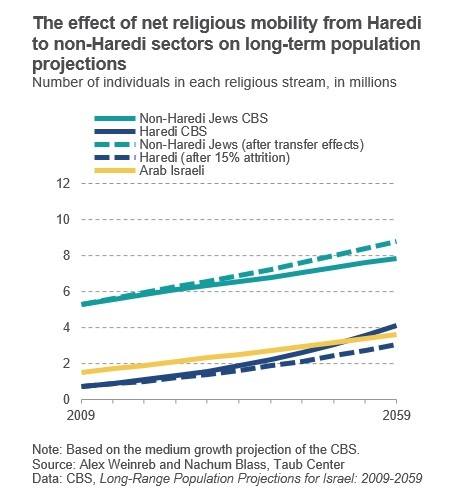 Long-term population projections do not take into account movement between the streams, although the Jewish population is experiencing a notable secularization trend. If the trend continues, the Haredi population is expected to make up about 21% of the population in 2059 (compared with 27% in the Central Bureau of Statistics forecast). This slower growth rate of the Haredi population will leave more time for other trends to develop, such as an increase in their integration into the labor market (page 21). The standard of living in Israel has increased over the past decade, partly due to an increase in nominal wages and a decline in the rate of price increases. For many years real wages did not rise despite a rise in productivity. Changes in the past few years have reversed this trend, and the rise in real wages is catching up to the rise in productivity (page 25). Despite a decline that began during the current decade, price levels in Israel are still 14% higher than the OECD average. There has been a decline in prices in most expenditure categories since 2005, mainly in industries exposed to competition from imported goods such as clothing and furniture. However, in the areas of housing and food, prices have risen since the beginning of the 21st century (page 28-29). Rental prices have risen by an average of 2% a year above and beyond the CPI since 2008, meaning that throughout the period demand increased more than supply. Housing prices have risen at an even faster pace. Possible explanations for this are a decrease (or expectation of a decrease) in interest rates, or an expectation that housing prices will continue to increase. Since the Bank of Israel’s interest rate has remained close to zero since 2015 it seems clear that there is no expectation of falling interest rates, and, therefore, the rapid rise in housing prices can only be explained by expectations of future housing price increases. In recent months housing prices have stopped rising, and the trend seems to be changing (page 30). The economy is in a relatively good state and the rate of labor market participation is the highest it has ever been, yet there has been a slowdown in productivity growth. One reason for this is that most of those joining the labor market are from populations with relatively low levels of education and earning capabilities. Improving the educational achievements of these groups could be a source of future economic growth (page 31). The Israeli economy is characterized by stark polarization. For example, high-tech salaries are 2.5 times higher than wages in the rest of the business sector. These gaps are significantly greater than in other countries. One reason for this is that in large parts of the business sector productivity has remained unchanged for many years (page 34). The poverty rate in Israel, when measured using disposable income, is the highest among OECD countries. However, in the last year examined (2016), the poverty rate had fallen by about 1%. At the same time, there was an increase in employment rates and the unemployment rate is low and continues to drop. In light of the planned increase in disability benefits and old-age pensions, there may be an additional reduction in the poverty rate in the near future (page 36). The sum allocated to the implementation of the Elalouf Committee for the War Against Poverty in 2017 was only 31% of the Committee’s recommendations. In contrast, a considerable sum was allocated to the “Savings for Every Child” program, which appeared among the recommendations but was not budgeted. The amount of money that will accrue in these personal savings funds is expected to be more or less sufficient to finance tuition for higher education (for families who choose to add NIS 50 from child allowances to the savings accounts). The program is not unique to Israel, but only in Israel is the allowance universal (pages 40-41). The percentage of government expenditure devoted to social spending is increasing, but at a very slow pace. Most of the increase has been in the health and education budgets. However, in the area of health, the increase has not kept pace with rising medical needs or with the increasing costs of medical care (page 37). The sum allocated for old-age pensions has increased due to the aging population, and the burden is expected to increase as the share of those of working age in the population declines. The decision to raise disability benefits over the next three years, from NIS 2,800 to NIS 4,000 a month is also expected to place a burden on the budget (page 38). The portion of those actually receiving the negative income tax is only 70% of the number who are eligible. In 2018, several changes are expected in the plan: extension of eligibility for single parents – adding in an additional 50,000 potential recipients; an increase in the benefit for men to make it equal to that for women; and an increase in the maximum permissible salary (page 39). About 37% of Jewish Israeli households spend more than their income. Among households seeking assistance in financial management, those with higher incomes owe more to banks, and those with relatively lower incomes borrow more from family members and friends (page 45). The share of health expenditure out of GDP has remained stable in Israel, despite an increase in medical needs due to rising life expectancy and the aging of the population, which has resulted in an erosion of about 10% in the real expenditure on health per standardized person, and an increase of 10% in the cost of medical care (page 50). 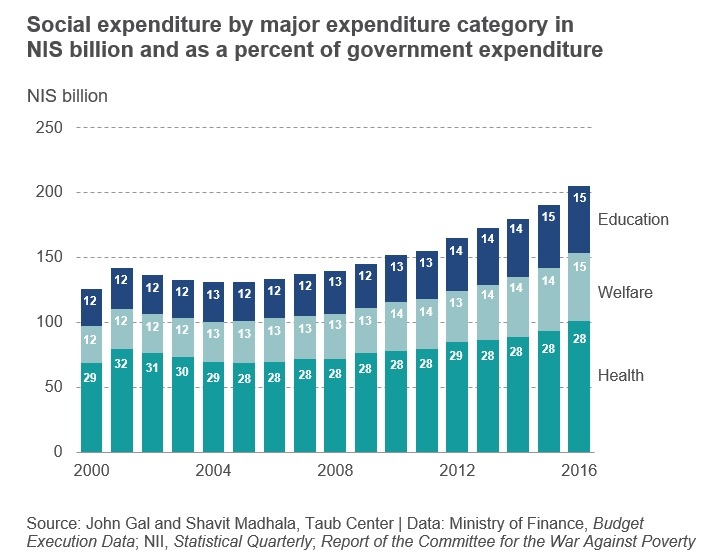 The gap between the share of public expenditure out of total health expenditure in Israel and its share in the OECD has increased almost threefold over the past two decades, and households are spending more on health services. 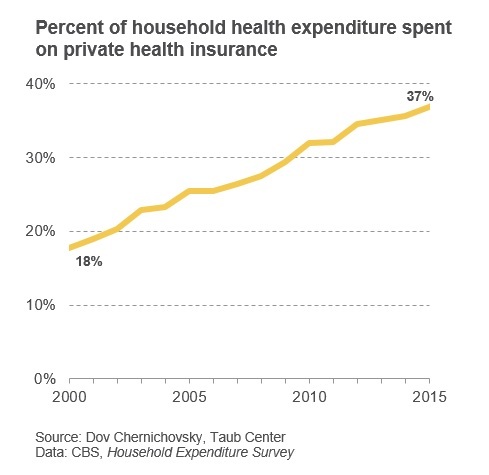 A major reason for this is an increase in the purchase of private insurance plans, mainly because they allow for choosing one’s own surgeon and shorter waiting times (pages 53-54). Life expectancy at birth for the Arab Israeli population is four years lower than for the Jewish population, and lower than the average in OECD countries. 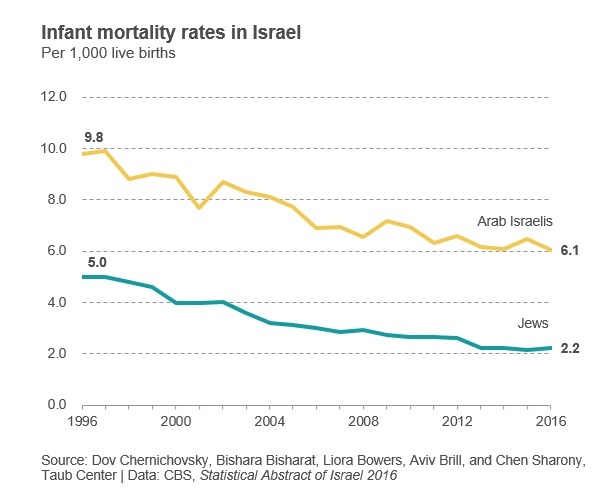 One of the reasons for this is that the infant mortality rate in the Arab Israeli sector is three times higher than in the Jewish sector. The main cause of the gap in child mortality is congenital disorders (pages 56-57). The lower socioeconomic status of the Arab Israeli population has an impact on the level of health; the higher the socioeconomic profile of a locality, the higher its life expectancy. The share of those qualifying for a bagrut certificate with five unit-level math rose from 10.6% to 13.8% between 2013 and 2016 in light of measures taken by the last two Ministers of Education to encourage this (such as the “safety net” for those who take the exam and the addition of math teachers and teaching hours) (page 67). Computerization and technology trends in the labor market have led the Ministry of Education to encourage vocational education tracks, so that even those who do not acquire an academic education can pursue relevant professions. As a result, the number of students in vocational tracks increased from 33% in 2010 to 36% in 2015 in the Hebrew education system, and from 40% to 43% in the Arab education system (page 68). In more than 60% of classes there was at least one student in 2015 who suffered from ostracism. Students in the Arab education system suffer from ostracism at a rate 3.5 times as high as do students in the Hebrew education system. With this, there has been an encouraging 38% decrease in the portion reporting being ostracized in the Arab education system, and a 30% decrease in the Hebrew system (page 75). 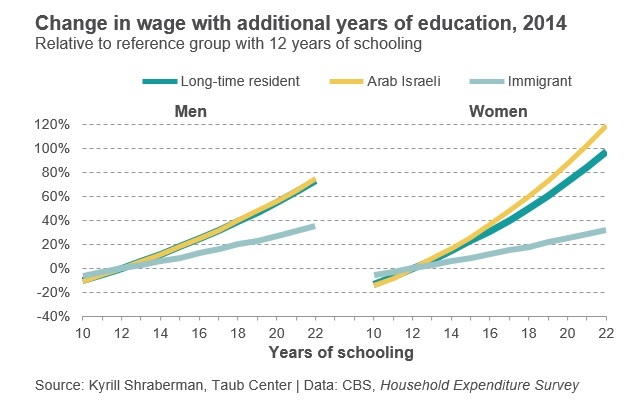 Returns to education are higher among women than among men, and a first degree is expected to yield an increase of 22.5% in the wages of Jewish women and of more than 26% for Arab Israeli women. Among men, however, the yield is expected to stand at about 18%. Among immigrants, returns to education are seemingly low – 8.8% for women and 9.3% for men – but this reflects the difficulty that immigrants from the Former Soviet Union in the 1990s faced in finding jobs that matched their levels of education, and returns to education for immigrants who came to Israel as children are similar to those of native born Israelis (page 69). 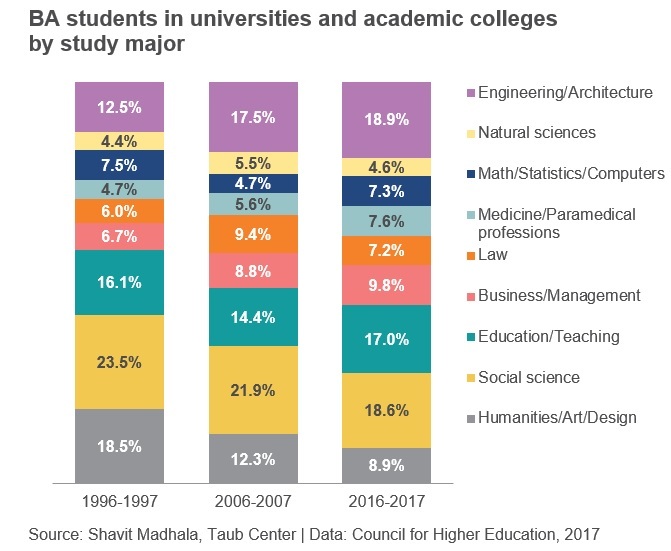 In the past two decades there have been significant changes in higher education: the percentage of students studying humanities has fallen by about 50%, and the percentage in the social sciences has fallen to less than 20%. On the other hand, the share of students studying business administration rose by over 50%, and the share pursuing medical professions by more than 60%. The largest absolute increase was in the share of students studying architecture and engineering (page 70). The Arab Israeli population has improved their achievements and narrowed gaps in education: the share of students enrolled in high school rose from 63% in 1990 to 93% in 2015, compared to 97% among the Jewish population. The percentage of female Arab Israeli students studying science and technology subjects in high school is high and continues to rise steadily, but does not translate into Arab Israeli women pursuing these subjects in higher education or employment (page 81,85). There has been a large increase in the share of Arab Israeli women studying in higher education, and the rate is currently double that of Arab Israeli men. However, they tend to study education at very high rates, as is reflected in the labor market – 3 out of 5 Druze and Muslim women with a degree, and 4 out of 5 Bedouin women work in education.It seems that the reason for these choices may be that the field of education allows Arab Israelis to work within their communities and in Arabic, and is considered beneficial for family life. Many Arab Israeli men work in the healthcare fields. Developing new employment opportunities in Arab Israeli communities, improving public transportation, and incentivizing hiring Arab Israelis may help to provide this population with a more balanced distribution of occupations (pages 90-91). Haredi men study law at a very high rate and Haredi women tend to study education and health; however, they also study more mathematics and computers than do secular women. In the labor market there are notable differences between the Haredi streams: among Haredi men ages 23-30, Chabad men work the most, with almost 50% employment in 2013. Among Haredi women, the highest employment rates are among Lithuanian women, about 80% of whom are employed. There has been an increase in employment rates over time among all Haredi streams, both for men and for women (pages 97-98). To read the full “Picture of the Nation 2018” booklet on the Taub Center website, click here.